In this post, I’m going to be showing you step by step how to migrate from Blogger to WordPress (self hosted), without losing search traffic to your posts. Now if you’re reading this, that means you probably have thought about the switch or at least have given it some thought. While Blogger is a great platform for personal blogging, I wouldn’t say that it is the best longterm solution or for those who want that professional look. Why don’t I think blogger is the best long term blogging solution? Google’s Terms of Service – Google clearly states in their TOS, that “by submitting, posting, or display content on or through google services…you grant Google a Wordlwide, non-exclusive, royalty-free license to reproduce publish and distribute such content” Essentially, Google is telling you that you don’t really own your blog. Google Can Delete your Blog – It is a pretty well known fact that Google is notorious for deleting blogger accounts, they even deleted their own once! Luckily, they took the time to get their blog back, however, you may not be so lucky. In their TOS, Google states “no responsibility or liability for deletion of, or the failture to store or to transmit, any content”. In essence, if something bad happens, you’re out of luck. Blogger is blacklisted in certain places – Libraries, Schools, and other public institutions readily ban sites like Facebook, Twitter, and even Blogspot domains. That means your audience could be limited, without you even knowing it. Difficult to Customize – If you’ve ever tried customizing your website you know Blogger can be a pain. Design Restrictions – Each Blogger website is only allowed 10 pages, and with that, you can’t use custom pages for your homepage. For some, this may be ok, especially because Blogger is free, however, personally this isn’t something I would like. Now that you have some info why Blogger isn’t the most desirable choice, I can start showing you how to actually do this migration. And it’s actually quite easy! However, if you do need help, we can actually set it up for you, free of charge. Just contact us and we can let you know how. A Web Hosting Account – Web Hosting costs around $4 a month, and is what is used to power your website. You can read all our reviews here, but we personally recommend SiteGround for new WordPress users, due to their nicely packaged WordPress Hosting accounts. A Domain Name – If you purchased a SiteGround account, they give you a free domain name! However, if not, you can easily purchase this for ~$10/year. First things first, before you make ANY changes to your site, be sure to backup your data. Blog Tools>Export Blog – You should have an xml of your blog, which you can hold on to for future reference. Be sure to hold onto this information. Because we aren’t actually deleting anything, nothing will happen, however it’s always best to have a backup, just to be sure. From here, simply click on Download full template and save this in a safe location. Assuming that you have already successfully installed WordPress, if not watch this short video, you’re going to log in to the Dashboard of your WordPress Website. From here, navigate to Tools>Import. Here you’ll be able to import content from any of the above networks. However, since we’re migrating our website from Blogger to WordPress, just click on Blogger and click Install Now, and it’ll download a small plugin to help us transfer our content. Also, be sure to click Activate & Install Importer. It’ll take some time for the importer tool to find all your posts, pages, and comments, however once it has, you’ll see a message showing the number of posts and comments you have. If everything looks good, click Import. Even though no images were displayed in the summary table, they were still successfully imported. After content has successfully imported, the boxes will change from white to blue and you can click on Set Author. At this point, you probably will only have a single author, yourself, however if you have more than 1, feel free to select the author of your choice. This will generally displayed above each post as Written By, as well as in determining who is displayed in the About the Author section. Don’t forget to click on Save Changes. Success! Your content should now be successfully installed. Feel free to browse through your posts, categories, tags, and media library. If all went well, you should see all your content, although some slight changes may need to be made to the format, so everything looks right. Technically, the migration is over. If you are a new blogger, this may be all you need to do. 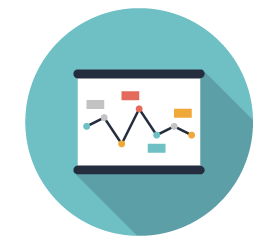 However, if you have been doing this a while and have been getting consistent traffic from google, chances are you will want to maintain your search engine rankings. So, read on to find out how! 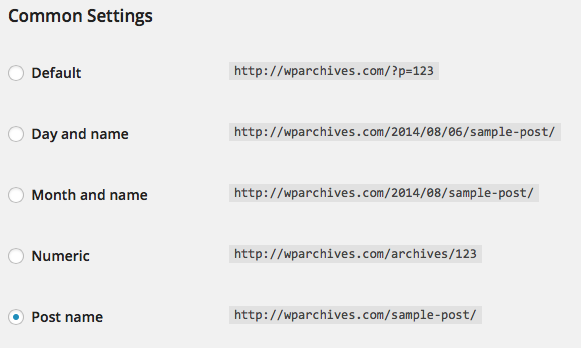 First things first, we must set up the Permalinks for our new WordPress website. Put simply, Permalinks are the structure of our link. Generally, we see websites links in the form of websitename.com/post-name, however WordPress allows us to format our links in a variety of ways: websitename.com/date/post-name, websitename.com/post-#, as well as many other combinations. 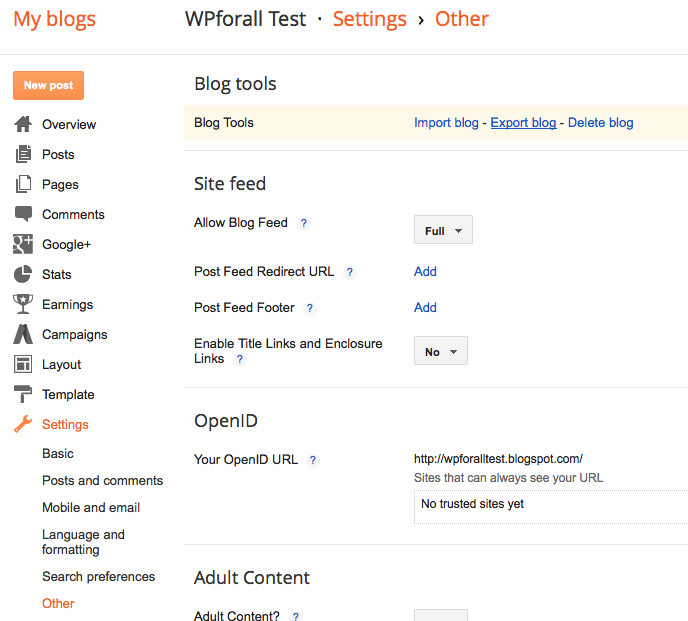 To change your Permalinks, simply go into Settings>Permalinks in your WordPress Dashboard, and select the Post Name option. As always, don’t forget to save your changes. On this Template Page, scroll all the way down and click on Revert to Classic Template. 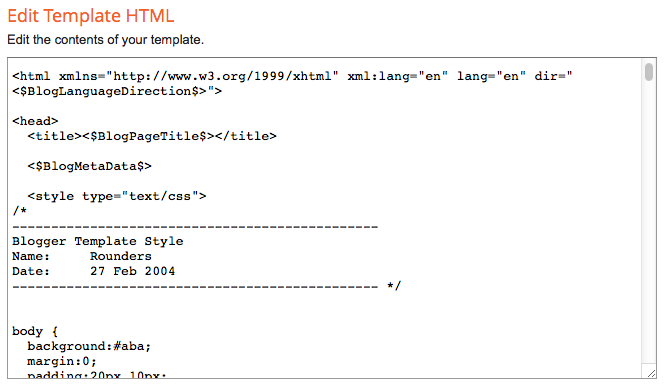 Once you have reverted to classic template, you should see a Edit Template HTML area. Go ahead and copy all of this and save it into a separate text file. We’re going to be replacing it with the following code, but it’s always good to have an extra copy of anything we change. 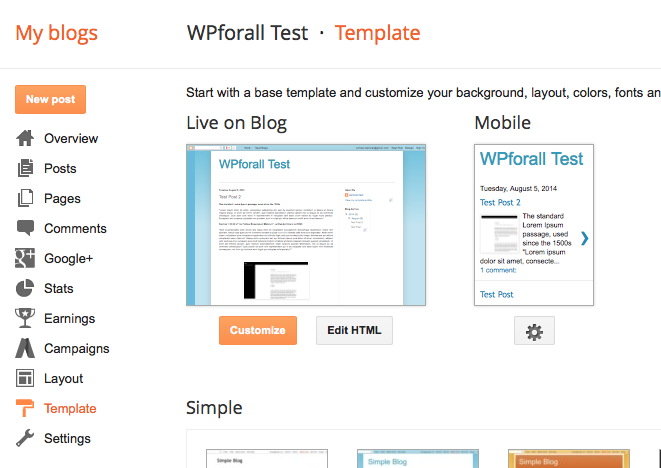 In order to redirect your users to the specific WordPress Post, we’re going to create a new WordPress Template. To do so, simply copy the following code into a text editor. I use Text Wrangler, but you can use any text editor – Notepad, etc. and save the file as Blogger-redirect.php. Feel free to change the file name, but it must end with .php. After you’ve saved the file, you’re going to need to upload this file into your themes folder. You can do this either by FTP or using the Filemanager (If you signed up with Siteground, you can use the Filemanager, which is located in your Cpanel). Once you’ve navigated to the themes folder, simply click on upload, at the top menu, and upload your Blogger-redirect.php file. 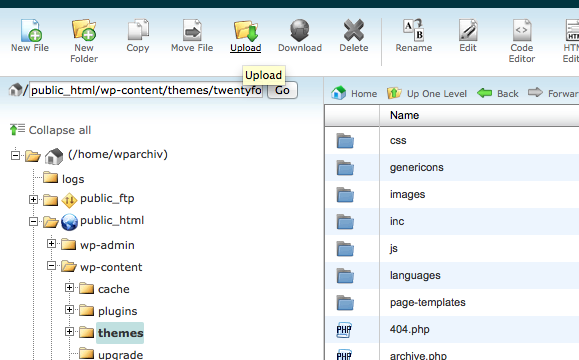 If you go back to your FileManager, you should see the Blogger-redirect.php file in your theme directory folder. 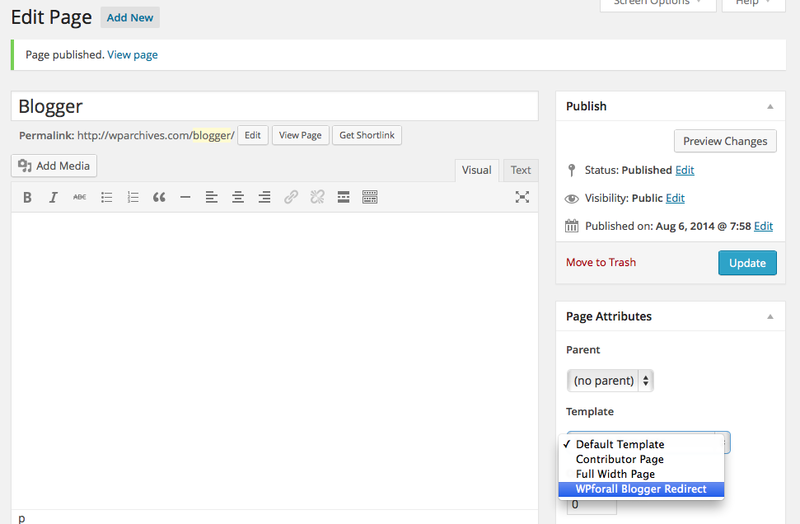 The last thing we’re going to do is Create a New Page and assign the Blogger Template to it. To do this, simple go to your WordPress Dashboard, and Add New Page. 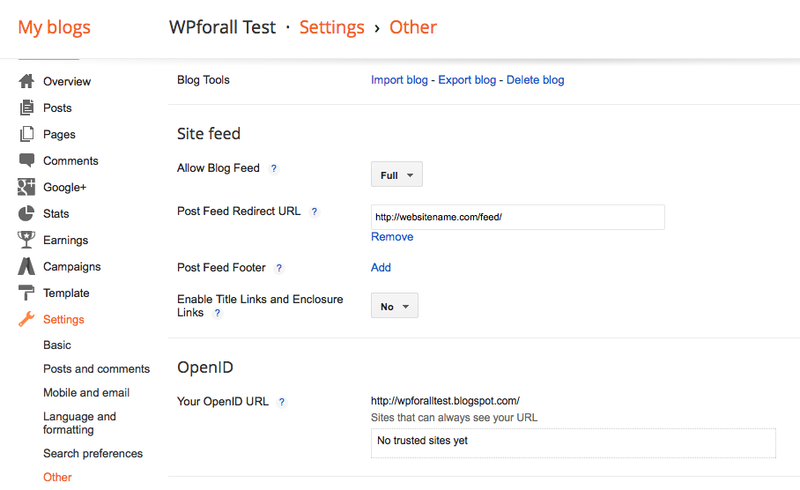 On the right side, under Page Attributes, change the template to WPforall Blogger Redirect. Be sure to publish the page, once you changed the page template. That’s it! If everything went well, and you didn’t skip any steps, your website has now been successfully migrated AND search results have been redirected. If you want to check if everything worked out, simply find the URL of an old Blogger post, and enter it in the Address Bar. If everything went well, you should now be redirected to your new WordPress Blog! If you don’t remember any of your Blogger Post names, another way to check is to go to your old Blogspot URL (website-name.blogspot.com). If all went well, you should be redirected to the home page of your new WordPress website. It’d be a shame to lose all your Blogger RSS subscribers. So to ensure a smooth delivery, we’re going to redirect our Blogger subscribers to our new WordPress Blog. To do this, simply navigate to Settings>Other>Post Feed Redirect URL. Here, you’ll enter in your WordPress RSS feed, which is always going to be http://websitename.com/feed/. Be sure to save your settings. More than likely, your Blogger Pages have not been migrated to your new WordPress site. 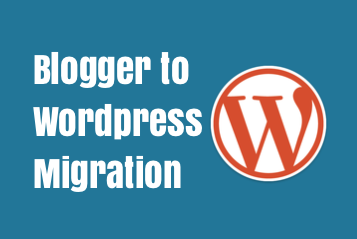 In the future, the Blogger to WordPress Migration Plugin may create a workaround for this, but for now, you’re going to have to do this manually. And since Blogger only allows up to 10 pages, this won’t take very long. Unfortunately, search engine rankings will be lost. However, hopefully the Migration plugin will fix this. To do this, simply find a Blogger Page, click on Edit HTML and copy the text. We’re copying the HTML to avoid layout issues in WordPress. From here, Add a New Page in WordPress, click on Text and paste in your HTML code. Be sure to publish your page once you’ve finished. Blogger to WordPress Migration – Success! You have now successfully migrated Blogger to WordPress without losing any search engine traffic. And with that, I would like to welcome you to WordPress! Feel free to browse our video tutorials to customize your WordPress website even further. And if you have any questions, suggestions, or updates, feel free to let me know in the comments below! Quality posts is the importtant to attract the viewers to pay a quick visit the web site, that’s what this site is providing. Hello Brent, I often watch your videos on Youtube and they have been very heufpll. I particularly enjoy Pont Neuf because there is so much going on. I am impressed by the way you have handled the buildings in the distance. Hi! I appreciate your help to users like me, who decided to move from Blogger (finally!) but aren’t sure where to start with. I wish I saw the post a littele time back… Though I’m pretty happy with my experience of using online converter (CMS2CMS). Being a total non-tech – I’ve been surfing the net for several days to find a tool to get the job done. I followed this tutorial http://goo.gl/zBcax7 and managed to convert to WordPress within less than half an hour. Hope, it will help somebody to save time and effort. P.S. though its a commercial tool – the prices are very reasonably priced (in my case it was $29). very useful article great post blogger and WordPress. There is definately a great deaal to find out about this issue. I have moved everything over from Blogger to WordPress and it looks great but…none of my old links on blogger take you to the actual post, only to the home page of my new WordPress blog. Can you help me? Also, I noticed since reverting my blogger back to the classic it only shows up as HTML, not as blog posts on the site. I am so close to having everything function properly but this last thing is driving me crazy. Please help.